The first PIO Parliamentary Conference will be held at Pravasi Bharatiya Kendra in Delhi's Chanakyapuri on January 9. Prime Minister Narendra Modi will be the keynote speaker. First PIO Parliamentary Conference will be held at Pravasi Bharatiya Kendra in Delhi. 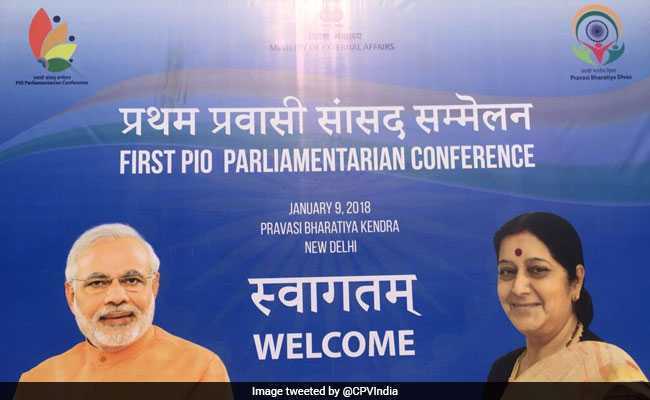 To forge stronger ties with Persons of Indian Origin (PIO) across the world, the first PIO Parliamentary Conference will be held at Pravasi Bharatiya Kendra in Delhi's Chanakyapuri on January 9, Tuesday. The conference will commence at 10 am with opening remarks by Minister of External Affairs Sushma Swaraj. Prime Minister Narendra Modi will be the keynote speaker. Every year, January 9 is celebrated as Pravasi Bhartiya Diwas (PBD), an annual celebratory day that marks the contribution of overseas persons with Indian origin (PIO) towards their homeland. As many as 124 members of parliament (MPs) and 17 mayors will participate from 23 countries including UK, USA, South Africa, Canada, Fiji, Kenya, Mauritius, New Zealand, Sri Lanka among others. The biggest delegation will be from Guyana with 20 members of parliament and three mayors. The US delegation will be represented by only two mayors as the Senate is in session. The keynote address will be followed by two Thematic Plenary Sessions - 'PIO Parliamentarians: A Journey from Struggle to Parliament' and 'Resurgent India: Role of PIO Parliamentarians'. The event will have two thematic sessions, the first one will have senior Congress leader and chairman of the parliamentary committee on external affairs Shashi Tharoor as a special guest. The session will be presided over by Deputy Chairman of the Rajya Sabha. The second session will have Parliamentary Affairs minister Ananth Kumar as a special guest which will be chaired by Deputy Speaker of the Lok Sabha. The conference will end with a valedictory session with an address by Vice President and Chairman of Rajya Sabha Venkaiah Naidu. Dnyaneshwar Mulay, Secretary, Overseas Indians Affairs, tweeted, "Delhi starts receiving delegates from 23 countries for the first ever PIO Parliamentarian Conference to be inaugurated by PM Narendra Modi on January 9, 2018 at Pravasi Bharatiya Kendra." "Many of these PIOs (Persons of India Origin) would be coming to India for the first time. We want to help them reconnect with the land of their ancestors in the true spirit of 'Vasudhaiva Kutumbukam'. And, this would also give us an assessment about the size of the Indian diaspora globally," Mr Mulay said. There will also be some tourism, cultural and sightseeing activities for the visiting members. The Ministry of External Affairs (MEA) has also organised an open competition to design a logo that would best reflect the spirit of the First PIO Parliamentarian Conference.